Whether she’s wearing knee pads or holding a clipboard full of scouting reports, Ashley Beyer has always found success in college volleyball. Former Marquette University outside hitter Ashley Beyer recorded 1,214 kills during her three years with the team, fourth in school history. She began her professional career in 2012 and played until 2016 when she joined the Hartford as an assistant coach. 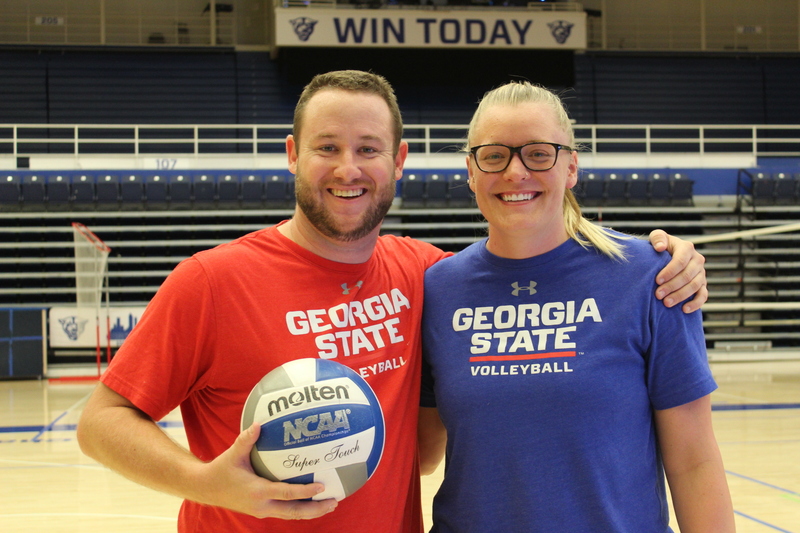 Beyer then joined the staff for Georgia State volleyball prior to the 2017 season. Beyer works with the other members of the staff on various tasks for the team, including watching film, scouting opponents, recruiting new players and handling equipment. As an assistant coach, Beyer helps with drills and serves as an extension of the head coach, offering one-on-one help to improve individual skills. A large part of Beyer’s motivation for coming to Atlanta was her history with head coach Sally Polhamus. “I was ready to find a university where I was going to be challenged as a coach and learn how to be the best person I could be. Sally recruited me as a player when I was in high school. I loved her determination and passion for the game. I knew coming here and working for her, I would grow and be challenged,” Beyer said. Not just anyone could serve in this role effectively. Background and personality are important factors in selecting a good assistant coach. Assistants require a strong knowledge of the game and a good attitude. Prior to Georgia State, Beyer had tremendous success as a player and a coach, making her a standout candidate for an assistant position here. While playing at Kishwaukee College in Illinois, Beyer was part of a 56-3 team that won the NJCAA national championship. She was also a star at Marquette, leading them to their first ever NCAA Tournament victory and received an AVCA All-America Honorable Mention in 2010. She played professionally from 2012 to 2015 in Sweden and Switzerland, as well as Premier Volleyball League teams in Wisconsin, Illinois and Ohio. Beyer understands that one of the keys to success in volleyball is working together. An average play in volleyball only lasts seconds, so the game is played at a fast pace and can swing and change direction quickly. “The best teams are made up of players who play for each other. Volleyball is such a roller coaster sport emotionally. If your team is emotionally stable and willing to work together, they will most likely be successful. As we call it here at Georgia State, being selfless and giving to your team,” Beyer said. Potentially the greatest responsibility for coaches is watching film. The head coach and assistant coaches spend much of their time assessing strengths and weaknesses for both their team and their opponents. “I would say I spend the most time watching film on ourselves finding areas that we need to improve or on other teams finding ways to beat them. In scouting, we look to see who their best players are and what each player’s tendencies/weakness are. We also look at the best offense and defense for us to run to put ourselves in the best position,” Beyer said. Beyer also works closely with fellow assistant coach Taylor McColskey. McColskey came to Georgia State in 2017 from an assistant coach position at Georgia Tech, working closely with recruiting before moving into scouting and individual training. You can find both head coaches cheering the team on from the sidelines. The Panthers return to the GSU Sports Arena on Sept. 21 to take on Coastal Carolina in their opening Sun Belt Conference matchup.